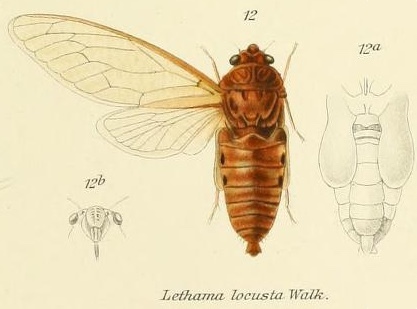 Lethama locusta (Walker, 1850) is a cicada found in India. Characters – lead horizontal, As long as space between eyes, not anteriorly deflected, front very prominent, margins of front and ver/ex obliquely sub-continuous; pronotum as long as mesonotum, its lateral margins oblique, sinuate, obscurely dentate; abdomen considerably longer than space between apex of head and base of cruciform elevation; tympana imperfectly covered, the flaps shorter and narrower than the tympanal cavities; rostrum about reaching the posterior coxae; anterior femora armed beneath with two or three strong spines; opercula extending to more than half the length of the abdomen, sinuate, wide apart and on the lateral abdominal areas; tegmina broad, their greatest breadth more than one-third of their length, apical areas eight, basal cell much longer than broad. The illustration and description comes from the journal Genera Insectorum, and a specific article from 1914 by W. L. Distant titled Homoptera. Fam. Cicadidae, Subfam, Gaeaninae. Read it on the Biodiversity Heritage Library website. Species name verification comes from Allen Sanborn’s Catalogue of the Cicadoidea (Hemiptera: Auchenorrhyncha).